What follows is the mirrored section “Our house” (@http://www.living-equia.com), which contains the most important information on the project. Responding to the task to build a prototypical solar house, the living EQUIA team adheres to successful principles of solar construction, concerning design, functionality and esthetics. Furthermore it aims to refine essential terms and materials. 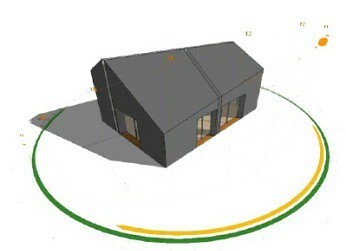 With its design the Berlin team wants to offer interesting approaches and establish a new solar architecture. How can architecture as a crucial driver of our esthetic an ethical education contribute to raising environmental awareness? Living EQUIA extends the current discourse and relates the classical architectural concept of the solar house to our experience, our behavior and our environmental awareness. The factors sun, light, and time (daytime and season characterized by the sun’s position) are particularly influential to our behavior and our condition. Living EQUIA provides a new gateway to these factors, as well as their sensual and emotional potential, within our habitat and our daily life. We want to pay special attention to the competition criterion of sustainability. This includes, for example, preparing an ecological balance sheet for our entire catalogue of components. The environmental impact of the materials will be considered as well as their origin and energy usage during the manufacturing process. Living EQUIA takes ecological construction seriously. harmony. 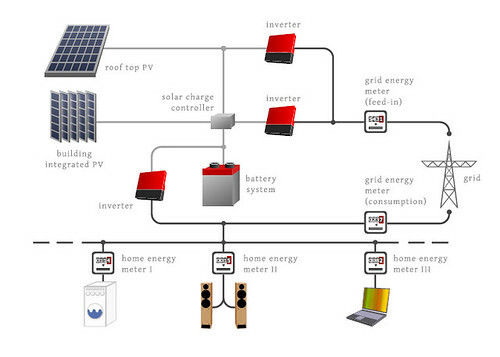 This provides for a natural but individual integration of photovoltaics into the living EQUIA building. Two light axes running North-South and East-West open the building. They align the house with the four points of the compass and emphasize the communication of the corpus with the sun. Thus the time of day can always be felt and seen. With the illuminated interior at night, the light axes suggest that the energy of the sun collected during the day would be radiated back: an esthetically innovative interaction of the house with its environment. The interior is spacious and light. On 74 m² the occupants have all possibilities for individual living arrangements. The flexible and modular design leaves no desire unfulfilled. The North-Eastern area of the house, defined by the light axes, incorporates all important functions in one segment: The bathroom, the kitchenette, and arranged behind, the engineering room, hidden from the inhabitants. The one-story living EQUIA house has a rectangular outline and a floor space of 74 m². It is separated by two 30 cm wide light bands, running North-South and East-West. The double pitch roof is characterized by inclining the eaves moulding, while the roof ridge is not parallel to the eaves moulding. The building will be mounted in Berlin in spring of 2010, before being shipped to Madrid for the competition event. Since there will be only 8 days for assembly on sight in Madrid, the design has to allow for quick assembly and disassembly. This implies a particular challenge for statics and construction. Therefore we chose an element construction method. The statically supporting layer of the roof elements is made of a 125 mm strong thick-timber panel, with the direction of span running parallel to the ridge. The three-pinned frame made of glued laminated timber with a bonded wedge finger jointing are located on either side of the light-band, running North-South. The roof elements stretch from the ridge to the three-pinned frame, with which they are connected via Z-shaped hooks. The walls are approx. 50 cm thick and are structured similarly to the roof elements. They feature apertures for windows and doors. The statically supporting layer is made of a strong thick timber panel, 85 mm strong. The ridge acts as partial load transfer of the roof. Both the walls as well as the two three-pinned frame provide the bracing of the building. The ground slab consists of eight elements, framed by a beam of glued laminated timber, on which the shear walls are mounted directly. The ground slab rests on various spot foundations, with the three-pinned frame reaching all the way to the foundations. The horizontal supporting forces are balanced with tie members below the ground slab. Engineering students within the team “energy and technology” ensure that the building is nicely cool during summer, and warm during winter. Small and large technological innovations in all areas reduce energy demand to a minimum, while providing maximum comfort. All technical appliances are carefully chosen for maximum energy efficiency and ecological compatibility. The entire energy necessary to operate the building is gathered from renewable sources – over the course of a year the house even provides more energy than the occupants consume. Vis-à-vis the low energy consumption, the living EQUIA house features photovoltaic panels. Since these produce more energy than the occupants consume, we refer to it as a “plus-energy building”. Surplus energy can be used to power an electric car, for example. The car’s batteries can also contribute significantly to the load management. The on-roof PV–system is integrated into the roof paneling and aligned with the adjacent solar thermal collectors: this makes for a smooth and appealing appearance in a consistent black. Berlin-based Solon SE, one of Germany’s largest PV-producer, sponsors the on-roof-system. In Mediterranean zones, the 34 modules with highly efficient monocrystalline solar cells will produce more than 6.300 kWh per year. 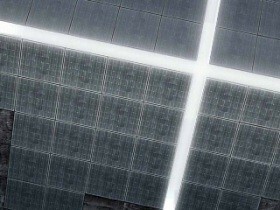 Additional solar cells are integrated into the shading elements of the windows, which were developed in close cooperation with the Colt Company. Through effective insulation the building on principle needs very little energy for heating and cooling. 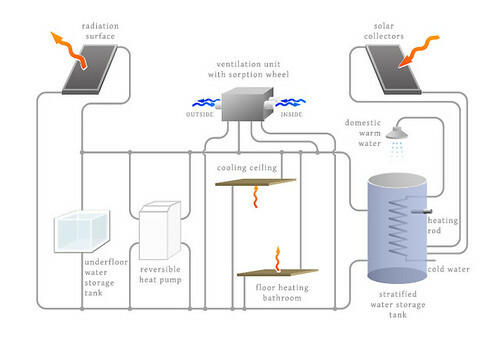 The entire demand for thermal energy is covered by solar collectors, integrated directly into the south side of the roof, and a highly efficient heat pump, which uses the fed-in electricity from the summer months. In exceptional cases a heating rod can cover peaks. During summer, mainly passive measures provide for pleasant temperatures inside the house: Phase Change Materials (PCM) for example form a large thermal mass. At night cool air automatically enters the house. The radiating surface – developed by ZAE Bayern – is a notable innovation: Through exchange of radiation with the sky, cooling energy for the next day is produced at night. A ventilation system with heat recovery is already standard in passive houses. Additionally the living EQUIA building features a system for moisture recovery. Together with walls encased in loam and a specially developed solar dehumidifier, we cater for optimal humidity throughout the building – at minimum energy input. Due to the different and challeging aspects of the competition, costs are not only arising on the implementation side but also on the project planning, managment, logistics and PR – all together more than half of the overall project costs. Most of the project costs are financed by the BMWi fund (Bundesministeriums für Wirtschaft und Technologie) within the program Energieoptimiertes Bauen (EnOB). Because these subsidies are earmarked (Personnel, R&D-orders, etc. ), they can only be used partly to cover the project costs. The complete volume of the project is about 1.1 m €. This includes supply and material costs as well as services and time spent by students, consultants and university employees who work on a voluntary basis. We are always searching and welcoming new co-operation partners for the implementation process of our architectural- and technical concept as well as for the collaboration in the segments of building industry, home automation and energy technique, furnishings and equipment transport and logistic.